Ten years ago, ‘futurologist’ and tech expert Richard Susskind wrote his famous, and controversial, The End of Lawyers?, in which he argued that technology is and will continue to drastically change the legal profession. 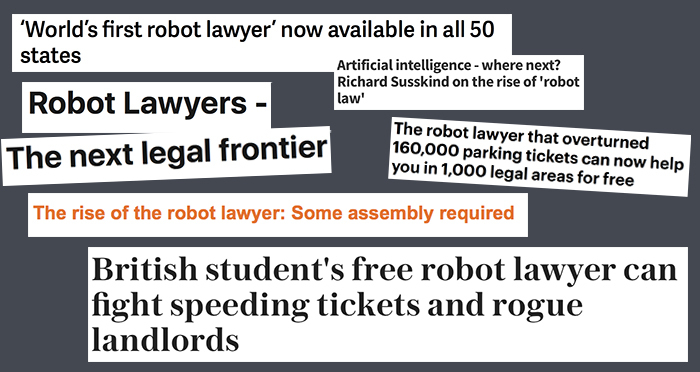 Since then, we’ve seen all manner of ‘rise of the robot lawyers’ headlines, including ‘The robot lawyers are here — and they’re winning‘ by the BBC‘s technology correspondent, and ‘Will lawyers be replaced by robots?‘, by the then president of the Law Society. The jist of these headlines and the words beneath them is that technology’s growing sophistication means it is beginning to encroach on the work of lawyers and paralegals. Some of this is speculative, such as the Law Society’s prediction automation could cause 67,000 job losses. But some is more perceptible: we have robot lawyers that can review documents, that can draft parking fine claims and that can predict human rights case outcomes. “Lawyers all over the world should be very scared of this technology,” computer science student and creator of the DoNotPay robot tells Legal Cheek. Lawyers have encouraged students to use this fear as a catalyst. 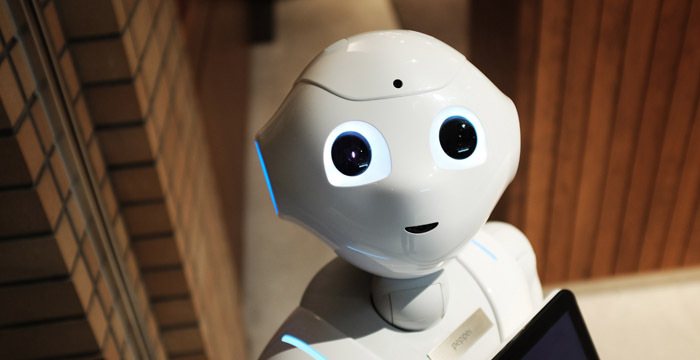 Students have been told by a host of big names at various Legal Cheek events to, at a minimum, be mindful of the impact of technology in the law or, better, actively prepare for it, such as by learning to code. An advice piece, ‘Ready for robot lawyers? How students can prepare for the future of law‘, published in The Guardian encouraged law students to seek internships at tech companies like Google and to study modules with internet and cyberspace content. You can forgive students for saying “thanks, but no thanks” to this advice. I would’ve done as a student: the traditional study of law mixes with technology like oil does with water. If I’d wanted to play with technology I would’ve done a computer science degree, but I wanted to read old dusty books that I have to climb up a library ladder to reach, thank you very much. And who has time to code in between all that crying about the Unfair Contract Terms Act, anyway? I’m unsurprised, then, that a recent Legal Cheek poll painted law students as techy blasé. 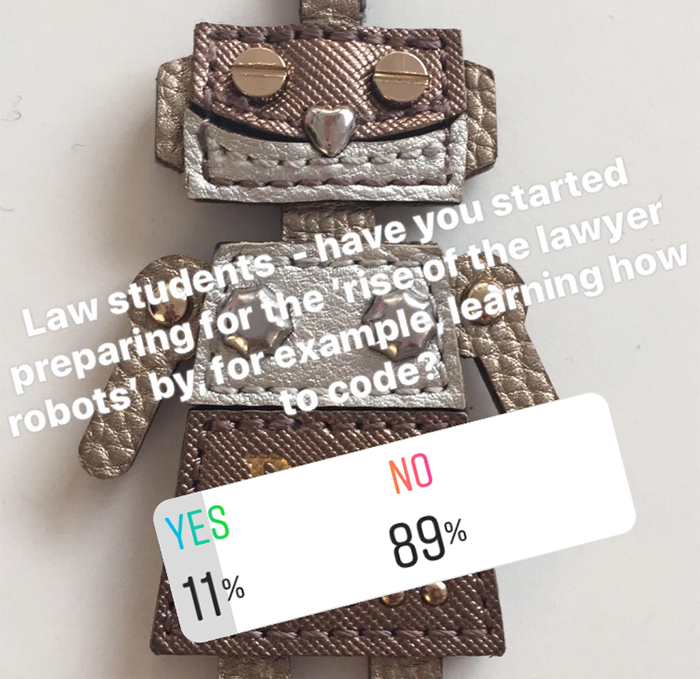 Of the 1,400 who answered when asked “have you started preparing for the ‘rise of the lawyer robots’ by, for example, learning how to code?”, just 11% said yes. But, despite this pervading nonchalance, the survey shows 160 respondents have heeded lawyers’ ’embrace innovation’ warnings. Tech enthusiast Izaan Khan is doing just that. A student at the London School of Economics with “a profound interest in the way technology interplays with the law”, Khan has learnt to code alongside his degree. He explains to Legal Cheek that this “has taught me to solve general problems using the same methodical and analytical mindset, while also pressing me to find better alternatives to solutions I do come up with”. Ultimately, he intends “to be the officiant in the marriage between technology and law”, he says. Also hailing from LSE is Kimia Pezeshki, a self-confessed “technophile” who completed the Graduate Diploma in Law (GDL) in 2016 and is now an in-house paralegal. While our two LSE graduates’ avidity for all things techy is clear to see, one group of Cambridge law students have taken things one step further and thrust themselves into the lawtech mix. Jozef Maruscak, Rebecca Agliolo and Ludwig Bull all either study law or have studied law at the elite university, in this time creating a crime-identifying artificial intelligence (AI) system to “provide confidential, non-judgemental, free, easy-to-understand legal knowledge”. Several rebrands later, the bot recently won a ‘man vs machine’ case-predicting challenge, which involved guessing PPI claim outcomes. Rise of the robot lawyers? Rise of the robot law students, more like. But don’t think you have to be smashing case-predicting challenges to position yourself in the lawtech game. On the more manageable end of the tech-enthusiasm scale, a number of law students have taken the view that a simple understanding of technology’s place in law and a good grasp of IT isn’t a bad thing. One student, speaking to me for this piece, thinks it’s fundamental young lawyers can use simple technological tools to help prioritise time and cultivate client relationships, while another says they’re attending workshops on Excel and cloud accountancy. For BPP Law School students, this more gentle approach to honing their technology skills doesn’t have to be discrete to their studies. Just recently, Legal Cheek reported the law school giant had introduced a new module on its Legal Practice Course (LPC), the aim of which is to “equip students not only with the digital skills the legal practice of the future will need, but also the ability to use and design technology to respond to problems”. To end this article where it began we turn to the views of Susskind, who has long been pushing for law schools to better equip their students for future legal practice with more tech content on their courses. BPP’s move, having been made in a very competitive postgraduate course provider market, may encourage others to follow suit. The army of robot law students grows. We’re still using Windows 95. Learning how to code will not improve your chances of becoming a lawyer, and it certainly won’t offer you more job stability. Readying the baseball bat as we type. What a load of nonsense. The LPC is the easiest year of your life and you shouldn’t need to invest anywhere near that kind of time. I’m sure MC partners are quaking in their boots thinking about the stiff competition they face against PPI claims-solving robots. No, because people with more than one brain cell, unlike KK, LC et al., know that the whole AI taking over legal jobs is just a massive hot air balloon – perpetuated by self centred idiots in love with the sound of their own voice / look of their own linkedin posts, using all this grand buzz words to compensate for absence of any underlying substance. Nothing to see here. On a serious note, how are we doing for salary increases? Be useful LC and look into that. Thanks. This dead horse gets a flogging again. Will developments in IT change the legal profession? Of course they will – due diligence and disclosure document review will increasingly rely on coding for first level review. All this will realistically reduce is the amount of work available to be outsourced by large law firms to paralegal armies – and I suspect the much-lauded (by LC) low cost centres set up by various city law firms will also be threatened. An obvious exception may be if you want to work in the specific areas of technology law where the extra understanding maybe helpful (in the same way that a biochemistry degree may be useful if you want to be a patent lawyer for GSK…). Basic tech skills are like the ability to read and write – you need to be able to work a Windows computer to survive in a law firm. You need to be able to use Word to a decent standard and Excel at a basic level (and a slightly more advanced level is welcome). You’ll get to grips with Acrobat as a trainee and PowerPoint might be helpful. Beyond that, by all means, be interested as a hobby (and use coding to develop logic and reasoning) but LC really needs to stop this rubbish – it’s so far removed from the reality of life at a law firm that it beggars belief (writing this as a near 8 year PQE at a US firm, trained at the MC). Will ‘automation’ be the buzzword of 2017? Will all the positions be gone by the time I qualify?